There is "no point" resuming an inquest into the Guildford pub bombs, a friend of Gerry Conlon, one of the wrongly-convicted Guildford Four, has said. Richard O'Rawe spoke out after Surrey Coroner Richard Travers resumed an inquest into five deaths in 1974. But Mr Travers said he did not agree the inquest should look at who bombed the pubs, wrongful convictions, whether police lied and the wider IRA campaign. He also excluded admissions made by IRA unit the "Balcombe Street gang". Mr O'Rawe, a former Irish republican prisoner, who grew up with Mr Conlon in Belfast, had initially welcomed the decision to resume the inquest as he believed his friend would get justice. But after learning of the limited scope, he said there was "not much point having it". There was little to be gained, he said, "if we're not going to be told who's done it". 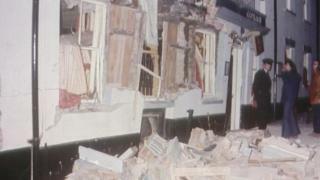 Two pubs were bombed on 5 October 1974. Soldiers Ann Hamilton, 19, Caroline Slater, 18, William Forsyth, 18, John Hunter, 17, and plasterer Paul Craig, 21, all died in the first blast at the Horse and Groom. A four-man IRA unit known as the "Balcombe Street gang" in 1976 claimed responsibility, but they were not charged. Over the years, it has been disputed how many members were in the unit and court transcripts suggested up to 20. The Guildford Four - Paddy Armstrong, Paul Hill, Gerry Conlon and Carole Richardson - were wrongly jailed alongside the Maguire Seven. All were later cleared. Mr Conlon and Ms Richardson have since died. Mr O'Rawe added: "If we're not going to find out why the Guildford Four and the Maguire Seven were sentenced to long terms in prison, then what's the point?" Giving his ruling, Mr Travers said he had reservations on whether Mr Armstrong, the families of Mr Conlon and Ms Richardson, witness Charles King and survivor Yvonne Tagg had "sufficient interest" to be recognised as interested parties in the proceedings. But human rights lawyer Alastair Logan, who represented the Guildford Four, said: "Anyone with an interest in justice and truth let alone a victim of miscarriage of justice must have a sufficient interest." Christopher Stanley, from KRW Law, which applied to resume the inquest after the BBC obtained papers, said the inquest scope would be kept under review. He said any inquest could look at responsibility. Mr Travers is due to hold a further pre-inquest review to look at issues of scope, disclosure of documents and interested parties later this year. He said the attacks "still matter" to the people who died and the people of Guildford and added that "the deceased, the families and the public are entitled to hear matters formally in open court".